Like Tottori, Okayama and Shimane, Hyogo Prefecture lies at the centre of Honshu in the heartland of the Japanese Black and its native Mishima ancestry. The foundation of world-famous Kobe-branded Black Wagyu beef, Hyogo’s Tajima-strain genetics – sharply focused on marbling traits have been supremely influential in Wagyu breeding outside Japan since the early 1990s. Within Japan, Tajima is identified as a vital influence in the genetic composition of high performance Black Wagyu selected for marbling, growth and yield. But it is an isolated, quarantined – and increasingly inbred – family. Most of Black Wagyu recessive disorders and in-breeding difficulties can be located around Tajima breeding. To Japanese commentators, the sharp Australian focus on Tajima appears obsessive. An outcome of Australian ‘Tajima tunnel vision’ has been the market segregation of high Tajima cross-bred herds from mainstream beef production, where feeder returns are based on weight. Until the severe feed price spike from 2006, this Wagyu niche was handsomely compensated for reduced growth and yield by high marbling premiums. With recession pressure from 2008, premiums now elude many Australian crossbred producers. For very high content purebred and fullblood Wagyu, a viable future may mean adopting breeding practices closer to Japanese methods. 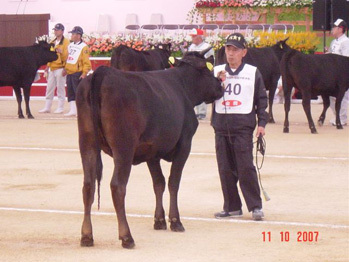 Notwithstanding the difficulties of 2008-2009, the Tajima subpopulation of Hyogo remains the most famous (and some would say ‘most successful’) Japanese Black cattle strain in the world. Hyogo is known as ‘Japan in miniature’, with a wide range of attractions and industries that effectively represent modern Japan. The prefecture amalgamates several former provinces including Tajima in the north, which remains largely agricultural and one of five official districts. Coastlines include the Sea of Japan to the north and the Inland (Seto) Sea to the south. Awaji Island lies between Honshu and Shikoku to the south and the world’s longest suspension bridge, Akashi Kaikyu, links Shikoku island to Honshu. Like many key Wagyu production areas, northern Hyogo is sparsely populated outside the city of Toyooka, and only a smattering of tiny villages populates the central highlands. 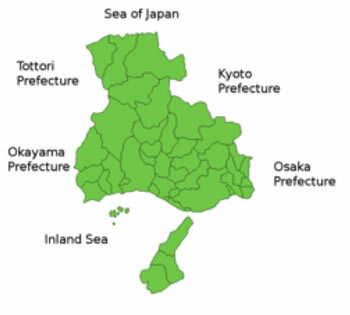 The greater population occupies the southern coast in the Osaka-Kyoto-Kobe metropolitan area. Summertime weather throughout Hyōgo is hot and humid. In winter, the north receives heavy snow from Siberian storms while the south is mild with occasional flurries. Official Symbol of Hyogo Prefecture Hyogo is highly accessible, Kobe being just 2.5 hours by Shinkansen (bullet train) from Tokyo station. The Kinsai International Airport (KIX) is Japan’s only 24-hour airport and less than 20 minutes from down-town Kobe. Hyogo Prefecture lies in the Kansai economic region – an industrial heartland of Japan, and a central hub for road, sea and air transport. The prefecture hosts internationally renowned companies such as Kawasaki Heavy Industries, Ltd. and Kobe Steel, Ltd. Many major Japanese companies, including Mitsubishi Heavy Industries, Ltd, Toshiba Corporation, Fujitsu Ltd, and Mitsubishi Electric Corporation, locate their research and manufacturing facilities in Hyogo and the prefecture is also home to many global niche businesses. A modern focus is nanotechnology. Kobe is a popular tourist destination and a showcase of many symbols of early contact with the West. The historic homes of early American, English and European visitors remain on the bluff overlooking the harbor and the “million-dollar view” of the Inland Sea. In the Bay Area is the nation’s second largest trading port, among the most famous in Japan. Numerous hot springs and spas are established throughout the Prefecture, including the famous Kinosaki Hot Spring Resort in Tajima. Closer to Kobe, the Nada district of south eastern Hyogo is famous for its street of sake breweries, many of which include sake museums and enable visitors to observe the brewing process. UNESCO writers describe historic 16th century, six storey Himeji Castle, about an hour from Osaka, as a “masterpiece of construction in wood, combining function with aesthetic appeal….” As a result of historical significance and easy access from Kyoto or Osaka by Shinkansen, Himeji Castle receives hordes of visitors annually. Tajima Province (但馬国, Tajima no Kuni) was an old province of Japan in present northern Hyōgo. It is most famous as the birthplace of Kobe beef, known locally as Tajima Beef. 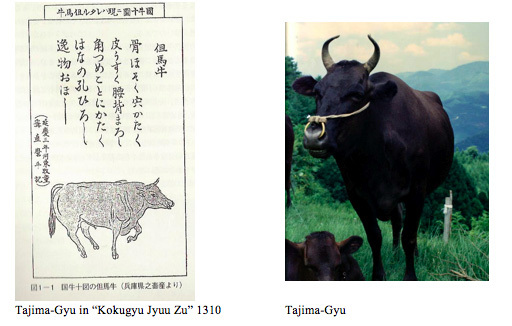 The TAJIMA-GYU, the most internationally famous of Black Wagyu strains, was first described in the manuscript “Kokugyu Jyuu Zu”, written in AD1310, which is the earliest written description of 10 Japanese Wagyu strains. This book defines key characteristics of Tajima-Gyu as “Narrow Bone” “Smooth Skin” “Hard Horn” “Lean Body” “Smooth Body Shape” and “Wide Mouth”. Tajima-Gyu has long been identified as an “Inbreed” strain and the contemporary Hyogo herd has minimal external genetic infusion. Tajima-Gyu was little different from contemporary Okayama/ Tottori Wagyu and was used for field and transport work. . By the Edo era, Tajima-gyu was well recognized as a compact work animal with a calm nature, widely used in the Kobe, Sanda, Oomi and Matsuzaka areas. These later became famous for beef production in Showa era. 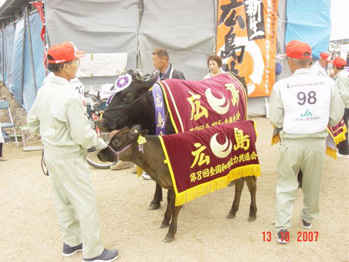 Among Tajima’s most famous tsuru (cow families) was the “Syusuke Tsuru”. The “Syusuke-Tsuru” was originated by Mr. Syusuke Maeda in Mikata-Gun. 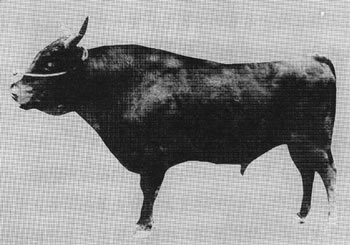 Syusuke-Tsuru cattle were small but admired for superior skin, hair, body shape and narrow bones – attributes very similar to modern Tajima Wagyu traits. Hozo-zuru, Rokube-zuru , Fuki-tsuru and Atsuta-zuru emerged from the founding Syusuke-tsuru. All these tsuru were the result of breeding between nearby kin families and bull sharing between small farms. Tajima province was relatively isolated to the north of other early Black Wagyu centres, so inbreeding was natural. As transport became more developed, wider genetics exchange commenced, and strong district-level tsuru characteristics disappeared. Kobe Beef was founded almost accidentally in the late 1880s. After the Japanese government opened Yokohama Port to foreigners in 1859, beef was sought after by the local foreign community. Wagyu were used mainly for work and were scarce in the Yokohama region. But an accessible supply was located in the Hyogo area and cattle began to be shipped from Kobe to Yokohama for slaughter in 1865. This beef was uniquely excellent and quickly defined by its point of origin, hence “Kobe-Beef”. Customer preferences dictated some changes too: breeders found that the foreigners liked fat animals, so they started feeding barley. Naka-Doi is the major blood line in Tajima Wagyu, founded on the sire Naka-Doi born in 1920. This line produced the outstanding sire,“Tajiri” who subsequently dominated bull breeding in Hyogo prefecture. Line features were body shape and meat quality, characteristics include pointed narrow hip and thigh, rising back line, brown hair colour. Low feed efficiency was the down side. More than 90% of bulls in the Hyogo-line belong to the Nakadoi-line, renowned for high marbling ability. The Nakadoi line can be broadly separated into the Kikumi Doi, Yasumi Doi and Oku Doi lines, founded on lines as illustrated below. Kikumi Doi Family (aka Kikuteru Doi): See tree above. Later maturing and known for good marbling and meat colour. Body type features good depth and length. Good maternal characteristics and volume of milk. Narrow hip is a body feature. Yasumi Doi Family: See tree above. An early maturing type producing very high marbling and excellent meat flavor. Tendency to lower weight gain. Body type features narrow hip and narrow shoulder. Oku-Doi Family: The Oku-Doi line started with the joining of Shiro-chi line female “Asa” and foundation sire Tajiri. Good marbling ability, medium growth. Kumanami line: The Kumanami-line was not well recognized in Hyogo prior to the sires “Shigefuku” and “Shigekanenami”. Shigefuku was the progeny of a Naka-Doi line female. Although Kumanami-line cattle are larger framed animals that also address feed efficiency issues, they were not initially favored by Hyogo breeders due to lower marbling performance. Subsequent breeder experience has revealed that pedigrees with Shigekanenami as a grand dam level antecedent can actually enhance Naka-doi marbling. The Shigekannenami line is recognised for good growth, good marbling and a well-balanced structure despite narrowness of the shoulder. Kumanami Bull Line Other Lines: Shiriichi line originated from the sire “Shirosaki-1” at Shirosaki-Gun and became known as “Yoshi-zuru” Well balanced body, straight back line and wide back are the characteristics of this line. Other significant lines in Tajima Wagyu were the “Cyouei Line”,“Nakajima Line”, “Kanemon Line’, and “Manjyu line”, most of which are not represented outside Japan. **The thin skin represents a lean body and less subcutaneous cover fat. Fine hair/ bone represents fine muscle fiber cells within the body that make exquisite marbling. Modern Tajima are generally small size with slow growth compensated for by superior marbling. A narrow hip/ thigh reduces the availability of hindquarter cuts. While it is not impossible to finish Tajima to large sizes through skilled feeding, this takes expert implementation and feed design on an individual animal basis. The process is likely to be marginally economic under current Western large scale production regimes with high input costs and constrained returns. Animal science has identified inbreeding as a threat to the entire Japanese Black Wagyu herd to the extent that Japanese scientists have recommended an formal upper limit to the use of AI sires (Nomura et al. 2001) This is a particular issue in relation to the Tajima cattle of Hyogo, as the herd has been closed to all influences outside the prefecture for over 100 years. It remains the only prefectural herd to retain this historic isolation and genetic singularity. Recent studies of inbreeding in Hyogo revealed that some sires were used for up to 20 years and that 95% of calves born were the progeny of just 20 sires (Oyama et al. 2007). Tajima genetic diversity has been measured to decline sharply since 1980 – reflecting this total dominance of few AI sires (Honda et al. 2001). All international foundation sires were exported in this period. Recessive disorders and hereditary ailment parallels high levels of inbreeding in Tajima strain cattle, although authors are careful not to point too heavily at the strain (for example, see Kunieda, T. 2005). Note that the principal application of gene marker analysis in Black Wagyu in Japan is in testing for these hereditary diseases, with a sharp focus on Nakadoi bloodlines. Because early global interest focused entirely on marbling, Tajima bloodlines have dominated Wagyu breeding outside Japan since the early 1990s. As cross-breeding was dominant, high Tajima sires were selected in an effort to optimize reliability in marbling outcomes, given 50% of progeny marbling predisposition (the dam input) was frequently unknown. Up to 75% Tajima content was common for F1 feedlot sire specifications. Potential weight and growth penalties were addressed with compensatory female selection. However, as feed costs rose from the early 2000s, and feeders encountered ongoing scatter-gun reliability in marbling outcomes, more rigorous buying regimes were implemented. The parallel paddock event was the retention of high Tajima crossbred females in many >F2 herds, where progeny marbling reliability remained uncertain, and growth/yield continued to decline with successive generations of Tajima joining. Fullblood bull production herds, focused on F1 sire supply, often filled with high Tajima females. The economics of Australian Wagyu feeding have since come under multiple pressures, highlighting a need for more cost-effective production. In the 2006-2009 period, vicious global feed price spikes followed by a decline in demand for premium longfed beef led to the near-cessation of Wagyu-infused long feed programs at many Australian feedlots. Premium food service markets then collapsed under recessionary pressure. By July 2009, no less august news source than the Wall Street Journal heralded the arrival of moderately priced, prime Wagyu cuts at the local grocery store. For some producers, price premiums turned to price penalties as Wagyu-infused cattle were forced to commodity markets at lower weights and with unpopular conformation. Tight times remain for all in the beef business despite massive global growth in consumer awareness of Wagyu beef appeal. The viability of the F1 Bos taurus crossbred premium niche looks uncertain for many producers. Nonetheless, we believe not only that the Wagyu market is here to stay, but that a new wave of Wagyu infusion to help boost meat quality in commodity herds will accompany a return to prosperity. So what place in the emerging order for Tajima genetics ? The only sire rankings that count in Australian Wagyu breeding are those arising from feedlot carcass databases. For most, this means there is only crossbred carcass data, as few feedlots have significant fullblood experience. A result is that the reputation of sires with strong credentials for fullblood or high content breeding may be ignored or vilified as a result of cross-bred outcomes. Globally, selection of high Tajima sires for cross-breeding continues to be successful standard practice over large frame females such as Brahmans and Holsteins. In Australia, most available ranking data has been collected from Bos taurus, especially Angus matings. Following is a Australian commercial ‘feeders’ eye’ thumbnail of leading Tajima AI sires, based on data derived from cross-bred feeder carcasses of Bos taurus type, such Angus. There are insufficient sires to consider more than three families. JVP Kikuyasu 400. 100% Tajima. Unreliable marbling, despite being the largest Tajima bull ever exported from Japan. Growth increment not significant. TF150 Kikuterushige. 100% Tajima. Poor temperament evident in some progeny. Shotgun results in marbling. Slow growth. ETJ 003. Kitateruyasudoi 100% Tajima. Reliable marbling performance. Some growth. Top 3 Selection. TF40 Terutani. 100% Tajima. (This bull combines the Yasumi and Kikumi-doi sub-families) Reliable marbling. Limited growth. Michifuku. 100% Tajima. Highly popular crossbred sire, reliable marbling outcomes. Limited growth. Top 3 Selection. TF148 Itoshigenami. 75% Tajima. Highly popular, reliable marbling outcomes, incremental growth from Itozakura infusion. Top 3 Selection. In the current economic environment, some downward revision of desirable Tajima infusion levels may improve cost-efficiency. The following information selects from Australian commercial-fed carcass data, with results typical of strain content. The total sample is about 100 fullblood carcasses. Marbling is in JMGA-equivalent scores. Principal Tajima dam-side sire influences are identified. Results : Superior carcass performance is clearly not limited by Tajima infusion, weights benefit from Tajima reduction, and very high/inbred Tajima levels as in the final example can perform poorly. Sires out-of-favour in the crossbred arena have performed satisfactorily as part of a marbling equation, if not always in growth terms. In full blood breeding, and most likely in high-content cross-bred selection, careful infusion of strains to balance Tajima content is required for cost-effective production. Other key parameters for feeders include ADG on feed where reduction in days on feed is a target, the balance may become particularly critical. For cow/calf producers retaining females as replacements, strain combinations have an important impact on desired cow size and subsequent production/maintenance equations.